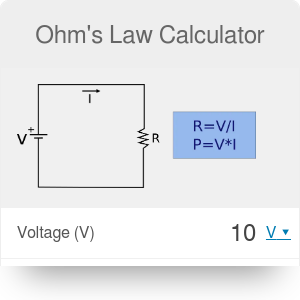 Our Ohm's Law calculator is a neat little app which helps you use the relationships between voltage, current and resistance across a given conductor. Ohm's Law formula and voltage formula are used mainly in electrical engineering and electronics. Knowing how to calculate power can be very helpful in the study of electronic circuits. All these calculations you can do with our Ohm Calculator. Ohm's Law is one of the basic rules in physics. It describes relationship between voltage, amperage (otherwise known as current) and resistance. Voltage refers to the potential difference between two points in an electrical field. Amperage is a flow of electrical charge carriers, usually electrons or electron-deficient atoms. The last term, resistance, is the substance's opposition to the flow of electric current. Ohm's Law states that the current flowing through a conductor is proportional to the voltage between the ends of this conductor. Resistance is expressed in ohms. Both the unit and the rule are named after Georg Ohm - the physicist and inventor of Ohm's Law. Remember that Ohm's Law formula relates only to substances which are able to induce power. This rule doesn't work with semiconductors and isolators. It is valid only under certain conditions, like fixed temperature. Looking for a real-life application of the Ohm's Law? Mak sure to check out the LED resistor calculator! Voltage formula is one of three mathematical equations related to Ohm's Law. The formula provided in the previous paragraph can be rewritten, so that you could calculate voltage on the basis of current and resistance. This value is measured in volts. Then the Ohm's Law Calculator will give you two values - resistance, expressed in ohms, and power, expressed in watts. Ohm's Law Calculator can be embedded on your website to enrich the content you wrote and make it easier for your visitors to understand your message.